"An Exorcist Confesses" -Padre Alfredo Pallotta C.P. 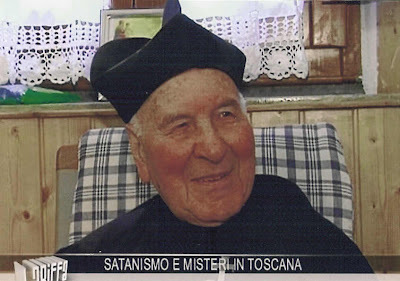 In part 2 of this story we introduced Padre Alfredo Pallotta C.P., who for 13 years was an exorcist and confessor at the Monestary/Sanctuary of Saint Gemma in Lucca. 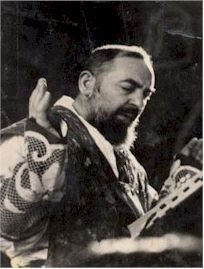 In the article below, we will present some excerpts from his book-"Un esorcista si confessa: Un'obbedienza e un mandato al Santuario di santa Gemma. : confessore ed esorcista" (“An Exorcist Confesses: An Obedience and Mandate for the Sanctuary of Saint Gemma: Confessor and Exorcist”) The webmaster would like to gratefully thank Mrs. Rita Dunn for the translation provided below. “In the fight against the demon our loved ones are at our side, but even more so we have the Saints for whom we have a special devotion, and we can invoke especially those who fought against him while they lived here on earth. St Gemma was one of these souls. She came to help me often to protect and combat against the malignant demons that had so attacked her during her life. She came especially during exorcisms done in her Sanctuary/Monastery. I would add that it is easier to obtain liberation in sanctuaries. I would call myself lucky to be able to perform exorcisms in the Sanctuary of [St Gemma] the Stigmatist of Lucca. Often the evil spirits would feel her presence, they feared her and many times they would flee. 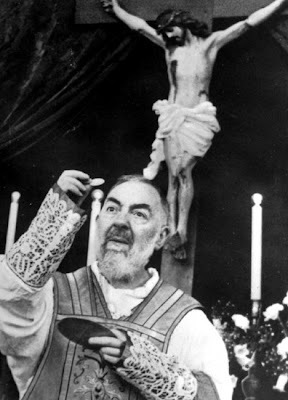 Another saint that fought much against the devil was St Pio of Pietrelcina [Padre Pio]. The evil spirits feared him and called him "the bearded man" or “beam of light" because of the light that emanated from him that so annoyed them. During the recitation of the Litany of the Saints, the malignant spirit would react upon hearing the name of certain saints. I would then purposely stop and repeat the invocation. All the Saints pray for us, but those whom we are named after pray for us in a special way. It is not coincidental that we were given the name of a particular saint. We are placed under their protection and they will not forget about us. Certainly they will more earnestly assist us if we invoke them often. Ordinarily the protection of a Saint is not manifested exteriorly as in the case of Fr. 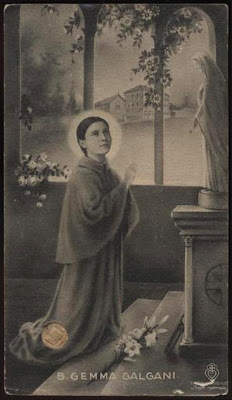 Candido, St Pio of Pietrelcina or St Gemma Galgani, as I previously noted. The same is true of the holy departed souls. Not always they manifest their presence as I mentioned in some exorcisms that I performed, but their assistance is very certain, thus it is necessary for us to remember them and that we implore their intercession. Let's remember also that our relatives that are saved are near the Throne of God and are dear to Him. The intercession of our dear ones is very efficacious. "HELP HER, SHE IS GOOD! "The words of Padre Candido that I noted on page 180 said: “In all truth I tell you, help her, she is very good. Much wrong was done unto her at one time". She is very good!". Some may come to think that those possessed by the demon are only dishonest people. Ordinarily this is not always so, as it was in the case of the woman that Father Candido assisted, as I have described on page 215, but we tend to think otherwise because of the appearance of their actions [meaning the exorcized]. 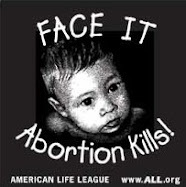 “Vigilance must be used most of all in cases of ordinary action of Satan, with which he continues to tempt man to evil. Temptation is a great peril and it is most damaging because it opposes itself to the Salvific Plan of God and the coming of His Kingdom. Satan is really able to take charge of what is most intimate in man when he puts himself under his power by a free and deliberate act of sin. For this reason a believer must be watchful not to be deceived and must pray every day with the words given by Jesus: "Father, do not abandon us to temptation but deliver us from evil.' ( Mt. 6:13). This so called 'ordinary activity of Satan' is the most dangerous, even if the individual is "calm" as opposed to the contrary that we may see in the individual who is truly possessed. But while the latter one is possessed in the body of which most often he has no control, the other may be possessed by Satan in the soul by means of sin, which is far more damaging because it keeps him away from God and leads him to death and Hell. In the new rite the instruction on vigilance further notes that: "diabolical phenomena of extraordinary possession, obsession, vexation, infestations are possible, but in the opinion of the experts they are in fact rare. 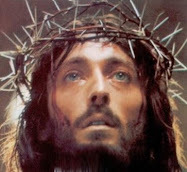 They cause great suffering, however they normally do not separate one from God, and do not have the gravity of sin". It concludes: “We would be wrong to give only attention to the presence of the Devil in some strange phenomenon and not to be preoccupied at all of the daily reality of temptation and sin in whom Satan the Murderer from the beginning and the Father of all lies is certainly at work". ( Rite of Exorcism, no. 7). sold their soul to the devil voluntarily, and not by ignorance, or perhaps they could have gone to magicians, witches, palm readers and so on, but now they have repented and have decided to go to the exorcist. I would like to underline that often a person possessed in the body is innocent and lives a life of prayer and truly a Christian life, free from serious sin and with frequent reception of the sacraments. We can reference that person to whom Fr. Candido stated: "She is very good". Shw was so good in fact, that she merited a heavenly intervention; the assistance of a holy soul sent by God who helped her numerous times, even after her liberation as she later confided to me. My thesis is this: often there is no sin in the possessed, and Heaven is present with them in an extraordinary way. Holy souls that are saved are often sent by Heaven to assist their loved ones in the combats against evil spirits. Also, Heaven often sends its angels. During exorcisms, I have noted the presence of St Michael the Archangel, and the presence of the guardian angel of the exorcised, as well as of St Gemma, St Padre Pio of Pietrelcina and the Madonna [Blessed Virgin Mary -ed]. All of these extraordinary presences are confirmed not only by me, but also by those present and also by the exorcised. 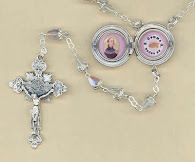 In regard to the Blessed Mother, I can note two cases. In the first case there were no witnesses because the husband did not want to see his wife in such a state, and neither can I report the testimony of the posessed, since she is very reluctant to testify. It happened that during the exorcism the person remained always with her eyes closed. At a certain point the evil spirit was leaving and she was like in ecstasy, her face was changed and I could hear words..: "my daughter, my daughter..." This happened during all the exorcisms that I had done for her, and in one of these I heard the words..: "Love me and make me loved!” Then she would return her normal self, and I avoided asking her questions. However, once I asked her an explanation, but she remained entranced in silence. As for the second case, below is the testimony of a person that was assisting in prayer during the exorcism, and also the possessed was agreeable to writing about the episode that happened in the presence of the Madonna and in the presence of holy departed souls and some Saints. In the presence of the Virgin. The first one to become aware of Her was the malignant spirit that screamed: “Here She comes, here She comes!" and she was making gestures to send Her away and she would scream: "Leave, leave!" "It’s a beam of light ... She is tormenting me... She holds her Son...on her head a crown like her Son...". Everyone could understand that the Blessed Virgin was present. Then I paused from the exorcism and I made everyone recite the 'Hail Mary', and then the 'Magnificat'. After a few moments the scene changed. The woman changed her physiognomy and seemed as if contemplating Mary, with her Son in her arms, and she was describing how she was dressed. This is how another exorcism [of the same person] ended in the presence of the husband of the exorcised. There was a very strong presence of St Michael the Archangel and also of the woman's guardian angel, as well as the Madonna. As usual, their presence was felt first by the devil. -This was so spontaneous that I began to sing along with her. September 15th is the feast of Our Lady of Sorrows, Patroness of the Passionist Congregation. On this day, during the blessing that I gave in the Monestary to this person, at 9pm Our Lady appeared with 7 swords on Her breast. I confirm to have felt twice the presence of the Madonna during several exorcisms that Padre Alfredo performed. I have to add some details that Padre and those present do not know. In the first presence, Mary was threatening against the devil. Inside me he would be turning in great anguish. I felt great cramps in my stomach and then would come screams like a wild beast that all those present could hear. In those moments, I could see the image of Mary, but only out of focus or like in the midst of a fog. However when the malignant one would leave, it was like if a window would open in front of me. I could see clearly the Most Holy Mother in all Her beauty, holding Her Child with a crown on Her head. The Child had a crown too and also a chalice in His hand. I was in ecstasy and I was contemplating Her while tears of joy would stream down my face. She was emanating such great joy which was noted by all those present, because my face would become serene. The song that Fr. Alfredo spoke of was sung spontaneously while the Immaculate Virgin was standing in front of me dressed in white, all enveloped in light. She was very beautiful. That song I heard only once before in church on the Feast of the Assumption of Mary. towards me from a distance, all dressed in white once again, and effusing in me such great peace and joy. I cannot give an explanation for all these appearances; perhaps it was a reward for all the sufferings that the devil caused me and also all those in my family. -R. S.
Translation of pages 254 /255. At this point I would like to talk about peculiar phenomenon in exorcisms. I have previously said that the Malignant One and all his mignons are slaves, and servants of the Lord. In the old Testament we see that God uses Satan to sanctify Job (cf. Job, ch. 1 & 2). I could cite many more examples in Christian hagiography. 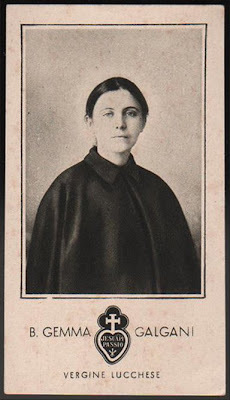 I limit myself to one only since it is so familiar to me: That of Saint Gemma Galgani. Even more [Jesus said to her]: "With my permission the demons will try continually to dishearten your soul". (Letters of St Gemma, 285). The demon will be relentless with St Gemma: “He repeatedly set himself against me!" As she wrote to her Passionist spiritual director, Fr. Germanus (v. Letter 71). However, the devil obeys the Lord and can do nothing without Our Lord's permission. What he does comes back to our advantage, for this reason the Lord allows him to torment us. And He replied: "But, I made her suffer". Yes, he makes us suffer, but he makes us gain more glory for Heaven. I have given examples in some of my explanations of exorcisms, demonstrating that evil spirits can indeed serve us, and that the Lord can use them to teach us some truths." -Taken from the book "Un esorcista si confessa: Un'obbedienza e un mandato al Santuario di santa Gemma. : confessore ed esorcista" (“An Exorcist Confesses: An Obedience and Mandate for the Sanctuary of Saint Gemma: Confessor and Exorcist") by Padre Alfredo Pallotta C.P. This book was published on St Gemma's feastday, May 16 2005, which is Providentially also Padre Alfredo's birthday. And in serving the people of God as a priest for over sixty years, many also admired Padre Alfredo for all the good that he did through his many exorcisms that he performed throughout the years. He helped countless souls by freeing them from the demonic. May God reward him for his many years of service as a priest who sought always to please the Hearts of Jesus and Mary. See also this article on Satan's war against St Gemma and how he tried to seperate her from her family. Glenn, what an extraordinary description of the devil, but he is nothing we are something. Thank you for your comment and for the beautiful poem. How true! “We would be wrong to give only attention to the presence of the Devil in some strange phenomenon..."
But I think we miss an extraordinary opportunity when it's ignored too. While the demons perform horrific acts by possession, they also expose the reality of the devil and, through the exorcism, expose the power and authority of Christ, and His lordship above everyone and everything. When people carelessly imagine that good and evil are simplistic ancient concepts, or that good and evil are equal but opposite forces, tell them to read Fr. Amorth's book on exorcism! a great book by catholic author robert epperly called Sons of Thunder, the Story of Joe and Paul, must be read by all and given to your teenaged children to read. I have read Father Gabriel Amorth's books "An Exorcist Tells His Story" and also "An Exorcist -More Stories" and they are indeed very good. Interestingly, Padre Amorth and Padre Pallotta (in the article above) are friends and both were guided by the late Padre Candido Amantini CP. Padre Amorth writes affectionately about Padre Candido in his 2nd book (An Exorcist- More Stories). These two men, among a few others, are among the greatest exorcists in Italy, and given their age and vast experience, perhaps among the greatest exorcists in the world today. 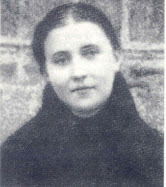 St Gemma battled the devil in an extraordinary manner for about 5 years, that is, until her death on Holy Saturday, 1902. Our Lady of America, pray for us. Thank you for this post! Full of great info, and info I needed to "hear" myself. "Virgin Mary, stomp on the head of Satan"